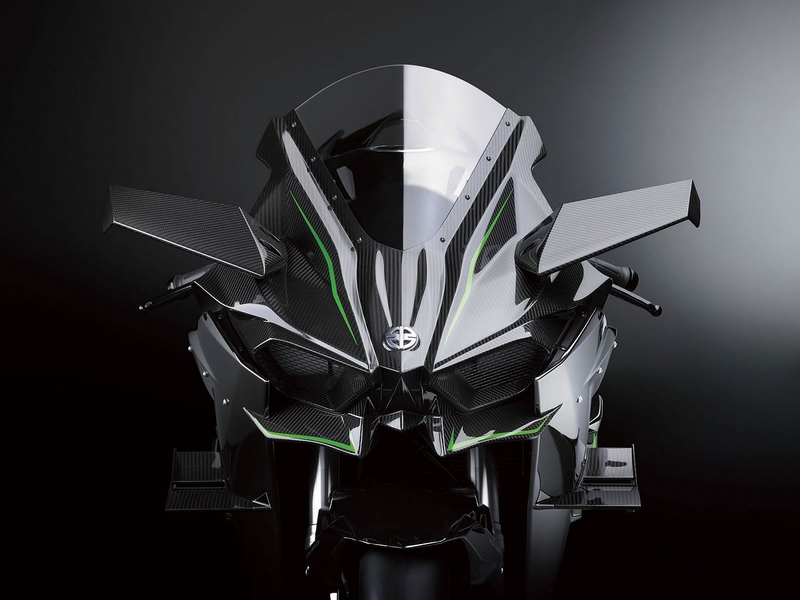 HomeBlogTechnologyKawasaki Ninja H2R Supercharged Superbike. Yes. Three-hundred horsepower! 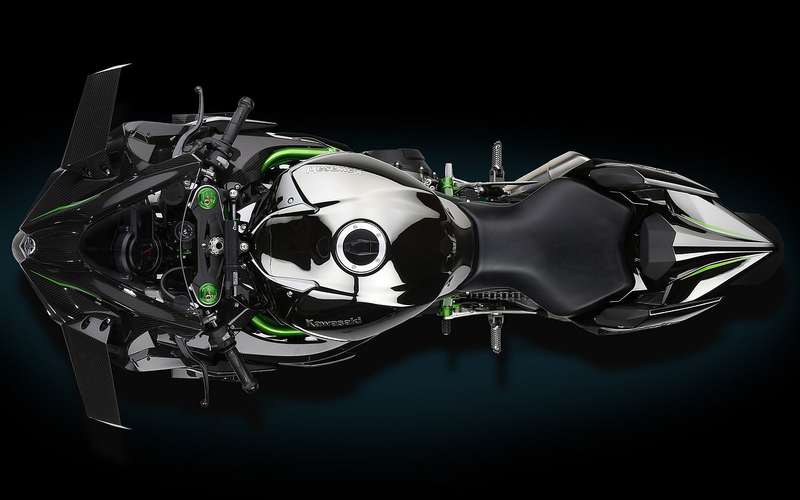 That is what the absolutely deranged Ninja H2R is putting out, and frankly there is no way to overstate this kind of power. 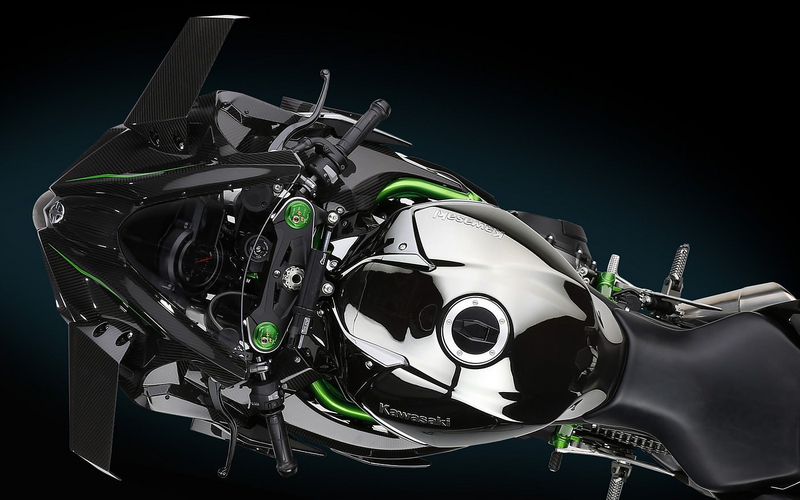 The folks over at Kawasaki say it was made “to offer the kind of acceleration most riders had never experienced before”. 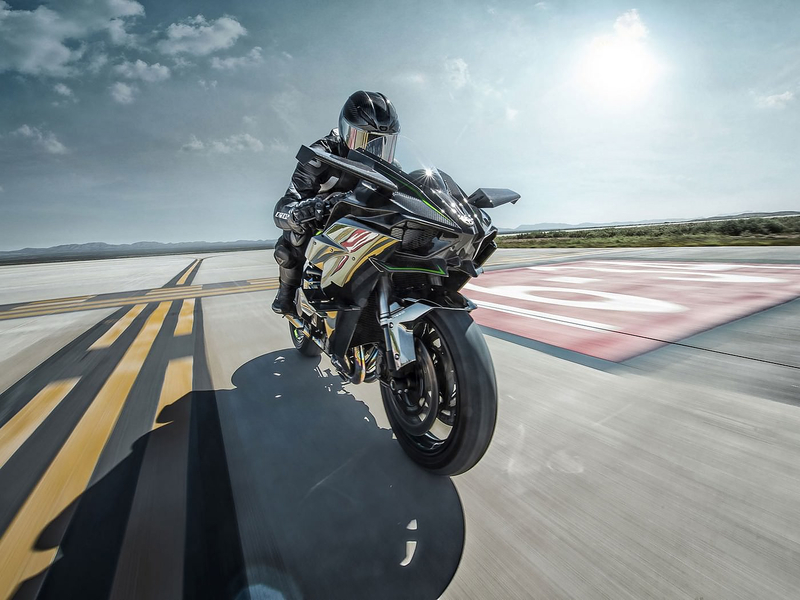 With this kind of brutal power, Kawasaki decided to develop it as a closed-course model, enabling an unadulterated pursuit of performance free of the limitations that street riding would impose. Hence there are no signals, no mirrors, and no headlight. 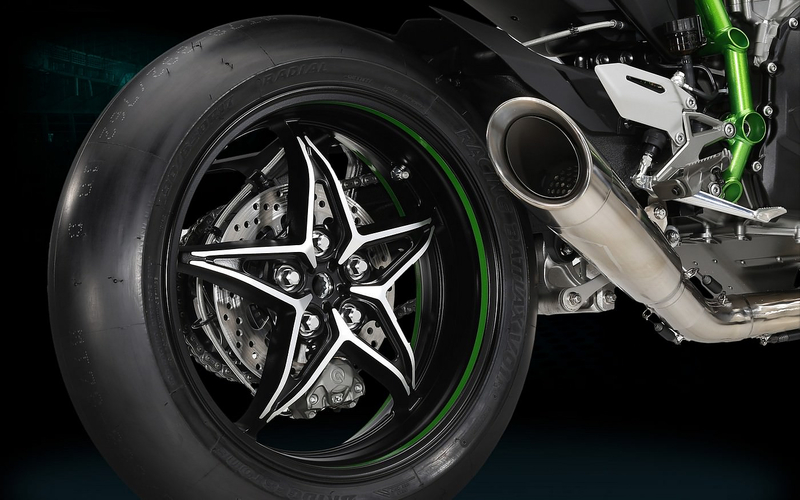 Seventeen-inch racing slicks are mounted at each end and the free flowing exhaust cannot pass a dB test at idle. 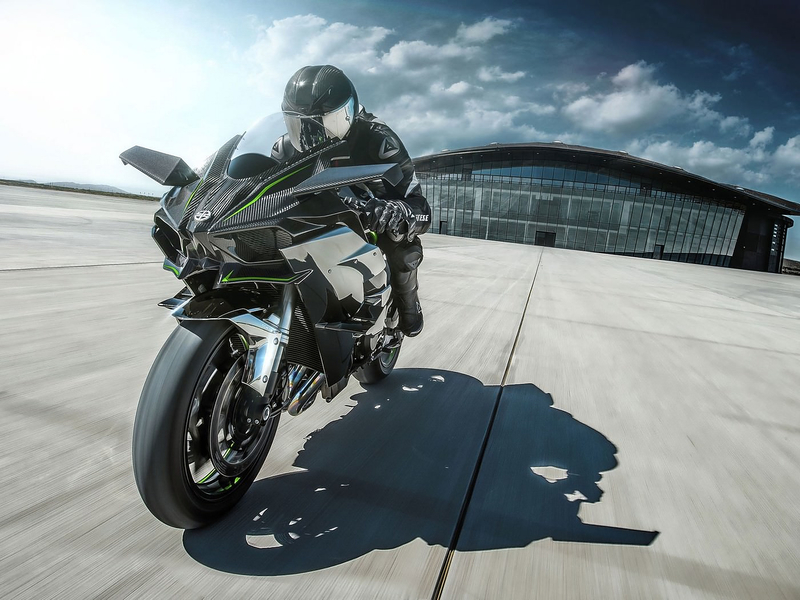 The Kawasaki Ninja H2R offers intense acceleration, an ultra-high top speed and supersport-level handling performance. The engine is a 998cc inline four with a centrifugal supercharger mounted on top. 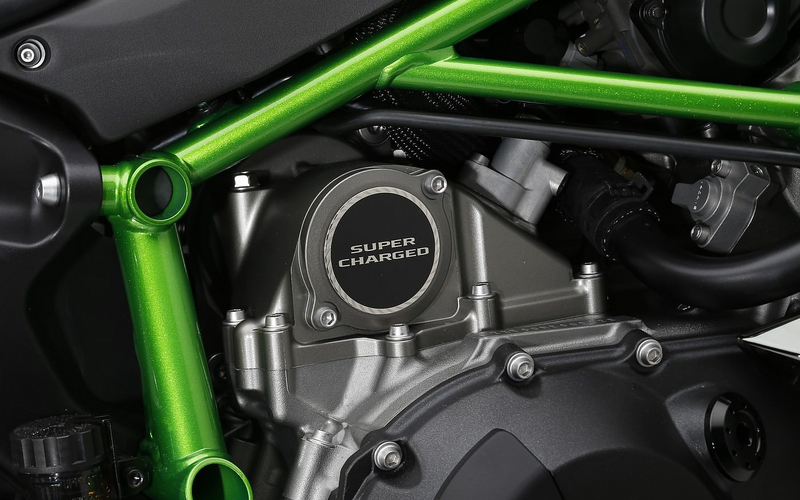 The decision to employ a “liter-capacity” engine with a supercharger, rather than say a 1.400cc unit came as a natural consequence because Kawasaki wanted to keep the weight and size of the bike low. 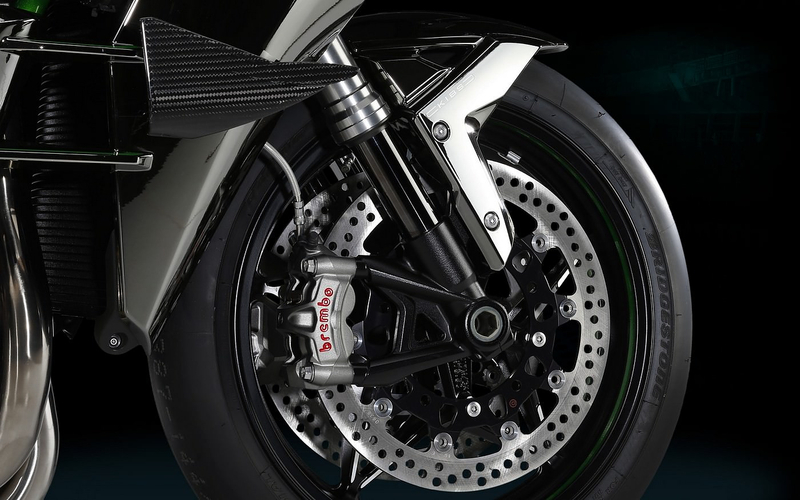 In order to be able to offer intense acceleration and a top speed in a range that most riders have never experienced, it was essential that the engine be able to produce immense power, while ensuring a lightweight, compact overall package. 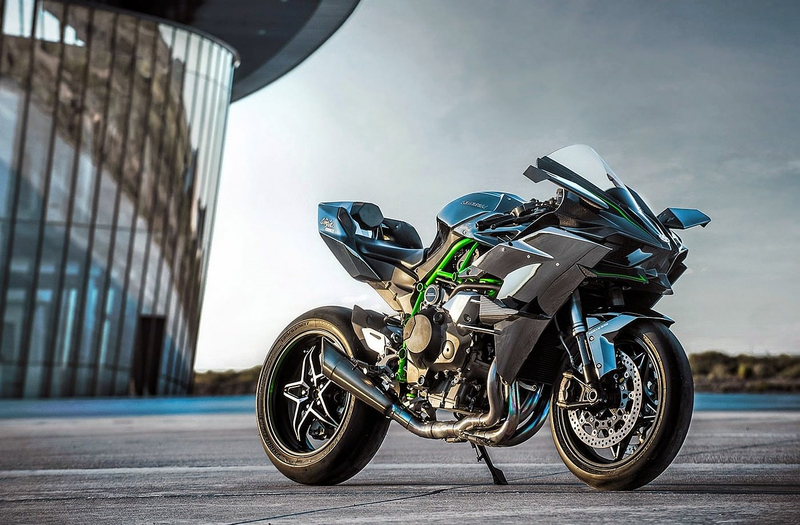 Using a supercharged engine enabled both of these engine design requirements to be met: maximum power output exceeds 300 PS, and the engine size is on par with other supersport liter-class power units. 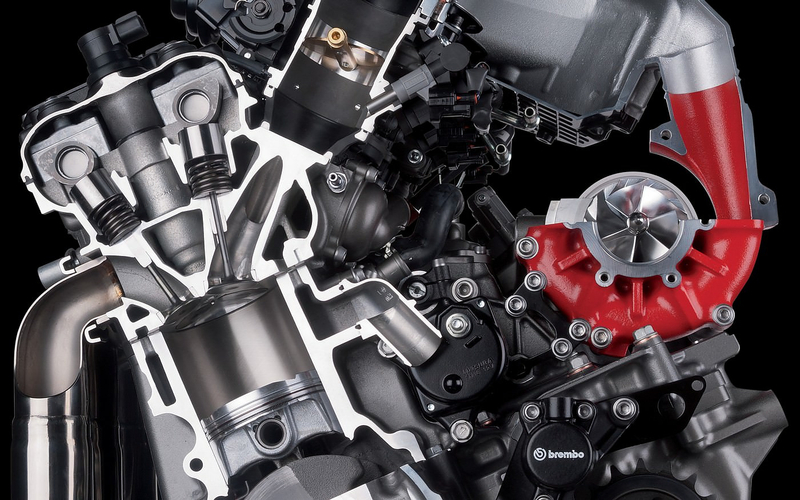 Designed in-house, the immense potential of the highly compact, highly efficient, supercharged 998 cm3 In-Line Four engine is a testament to the technology possessed by the KHI Group. 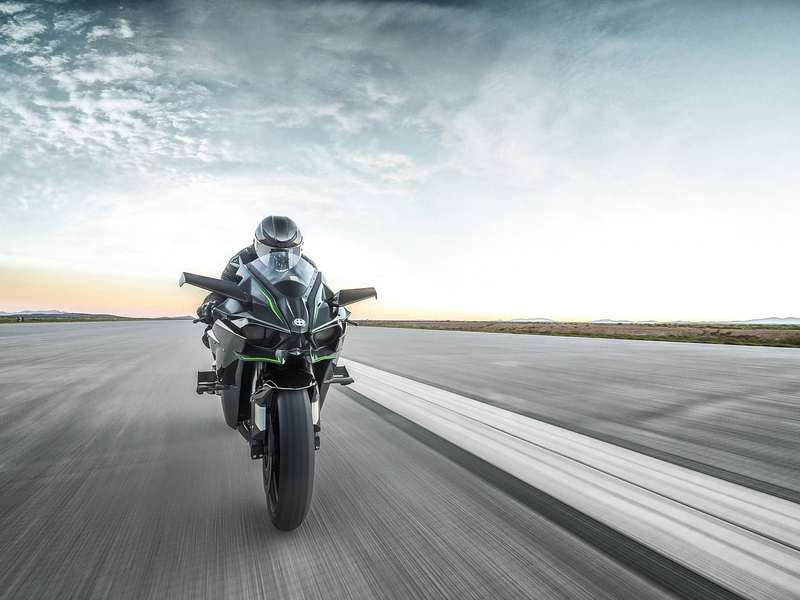 The objectives for the Ninja H2R’s chassis were to ensure unflappable composure at ultra-high speeds, offer cornering performance to be able to enjoy riding on a circuit, and finally to have a highly accommodating character. Ordinarily, high-speed stability can easily be achieved with a long wheelbase, but a shorter wheelbase was selected to achieve the compact overall package and sharp handling that were also desired. 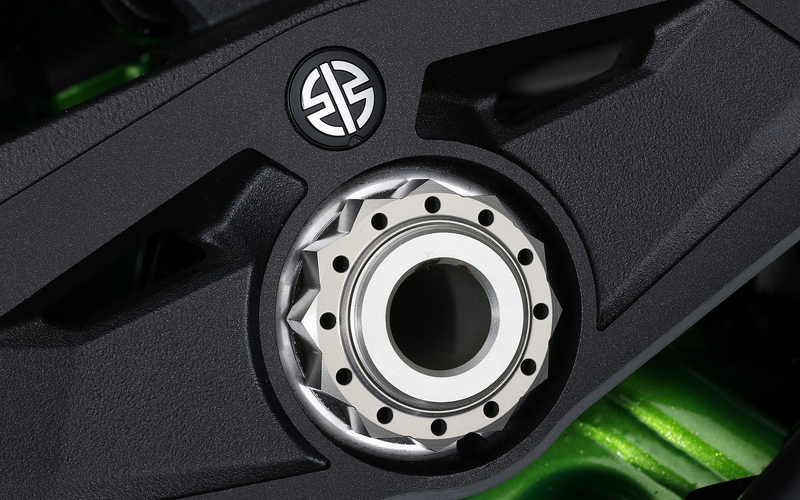 An innovative new trellis frame provided both the strength to harness the incredible power of the supercharged engine, and the balanced flex to achieve the stability and pliability for high-speed riding. Moreover special care was applied to the Bike’s aerodynamics. As speed increases, wind resistance increases exponentially. To be able to operate in the ultra-high speed range, a combination of high power and slippery aerodynamics was essential. 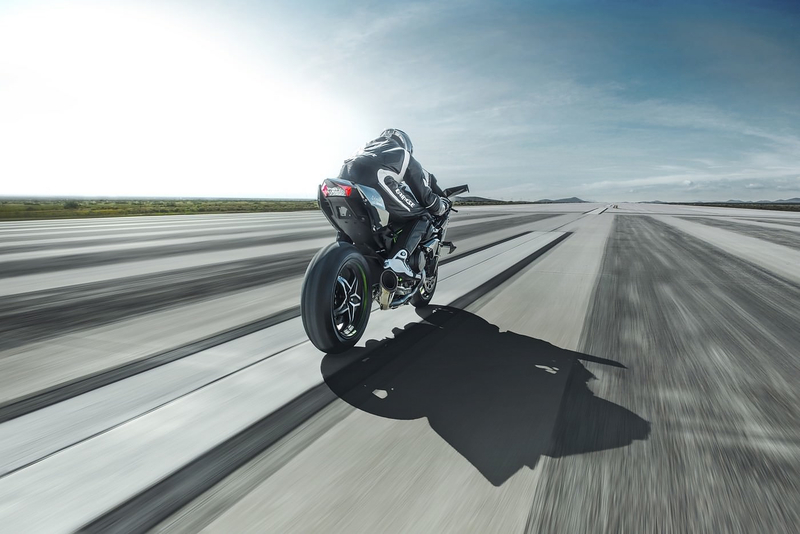 With power requirements taken care of by the supercharged engine, the next step was to design bodywork that both minimized drag and added control when riding at ultra-high speed. 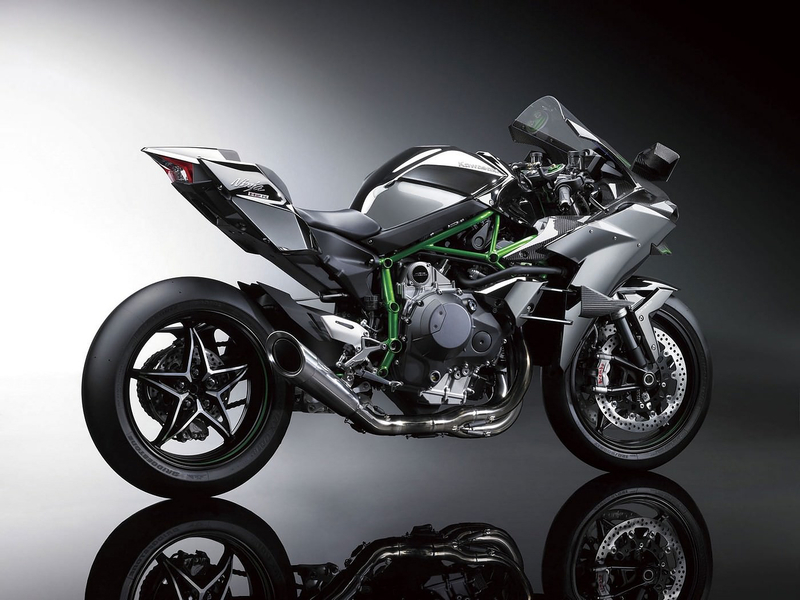 It is no accident that the Ninja H2R does not seem to have the aggressive forward-canted stance of most modern supersport models. 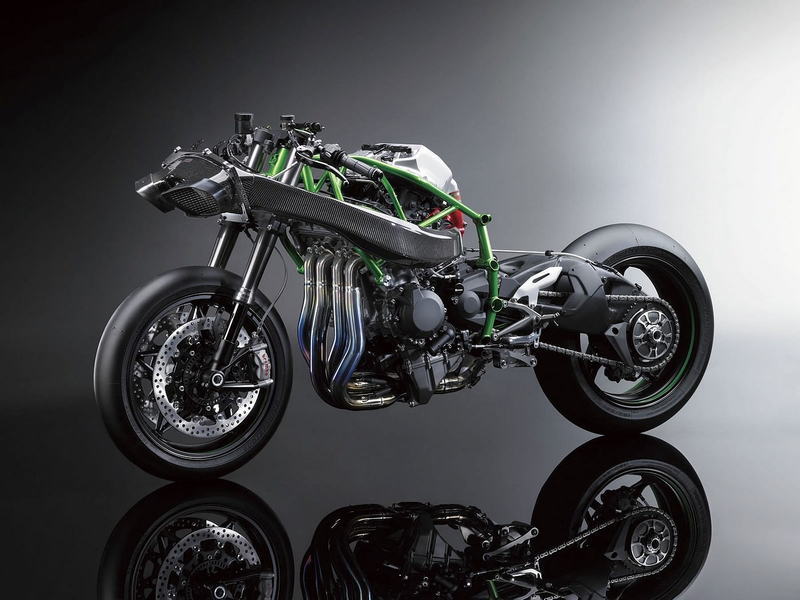 At the speeds for which the Ninja H2R was designed, such a posture would create drag that would hinder top speed aspirations. Instead, the stance is very neutral, almost flat—think Formula 1 car—to make the body as aerodynamically sleek as possible. 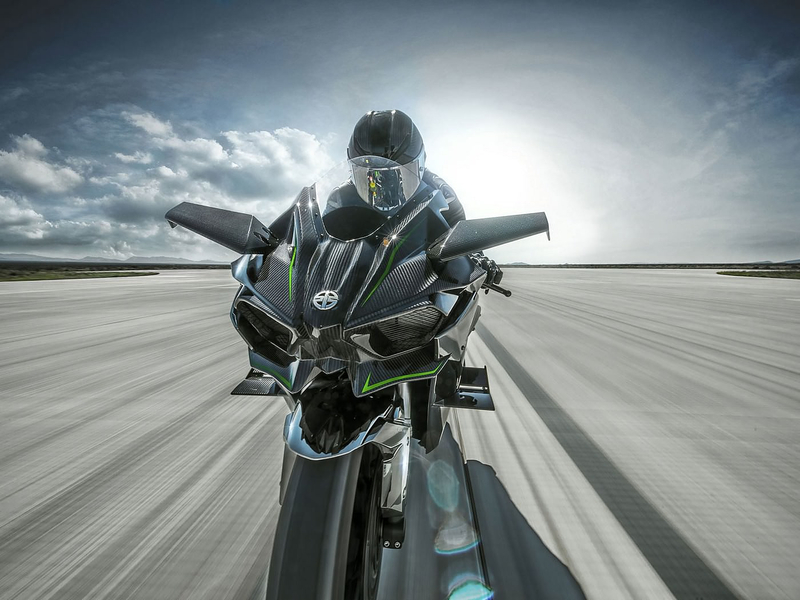 To perfect the aerodynamic efficiency of the Ninja H2R the design team enlisted assistance from Kawasaki’s Aerospace branch. The upper cowl uses lips and lines to help direct airflow over its surface, and positions the Ram Air intakes in the most efficient position. It also incorporates a chin spoiler designed to generate downforce that contributes to high-speed stability. 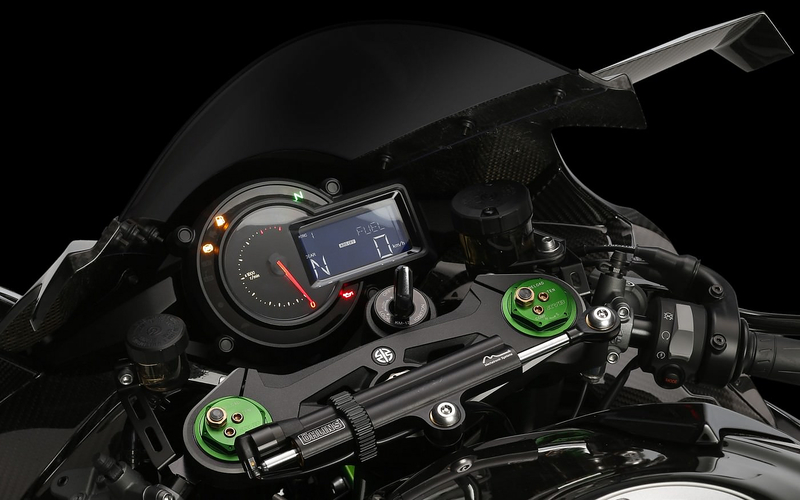 The cowl is formed from lightweight CFRP and is designed to afford wind protection at ultra-high speed: its tall screen is designed to help create a wind-free pocket for the rider. 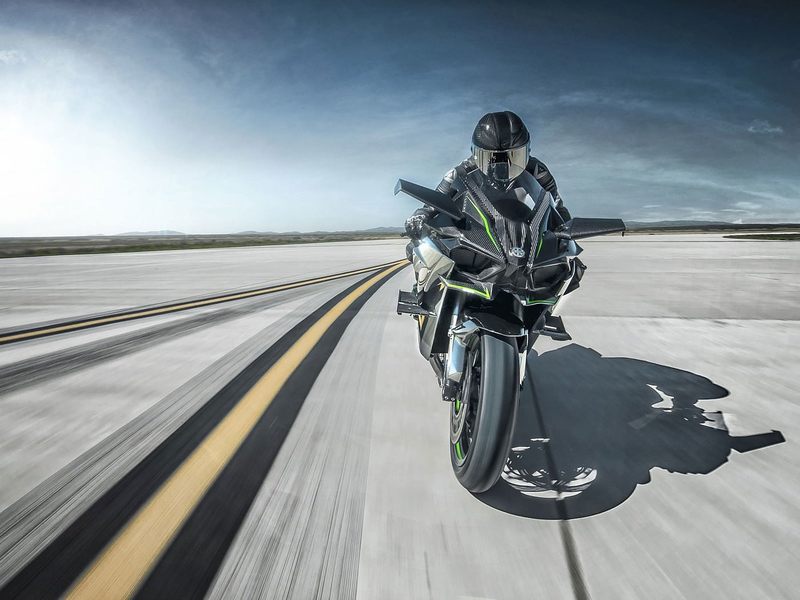 In order to maintain both straight-line stability and the control to change direction while running at ultra-high speed, a number of aerodynamic devices ensure the front wheel has strong contact with the ground. 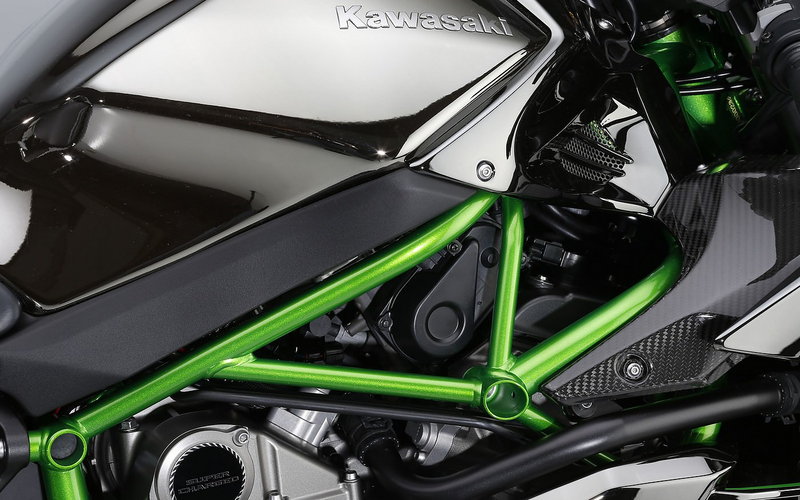 In place of mirrors, the Kawasaki Ninja H2R features CFRP wings mounted on the upper cowl. 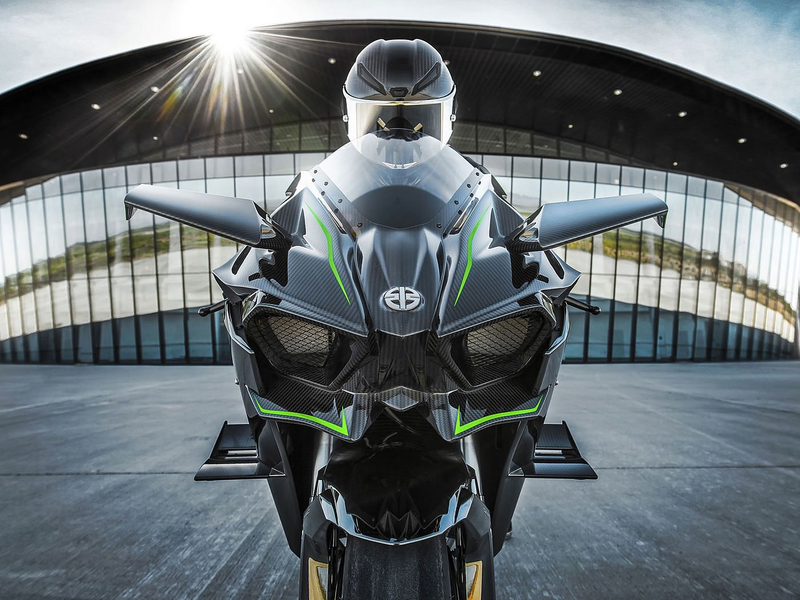 Designed by Kawasaki’s Aerospace company, they feature winglets to help smooth airflow near the wingtip by reducing the strength of the wingtip vortices that would otherwise cause turbulence or disturb the laminar flow needed for the wings to effectively generate downforce. 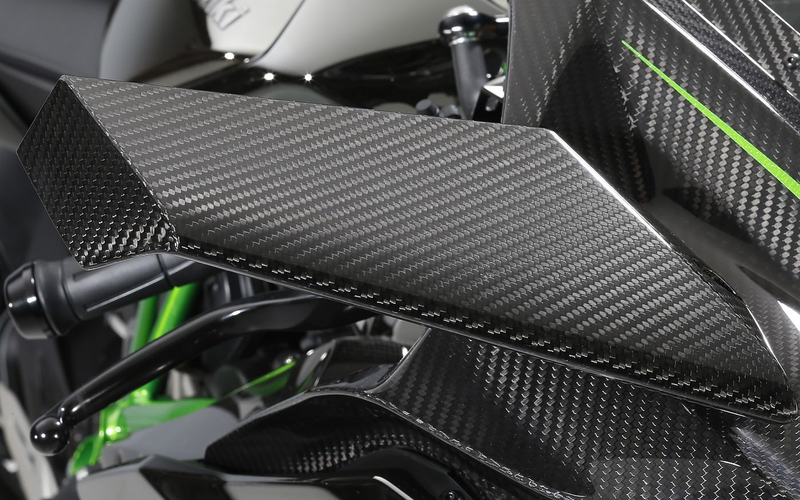 In addition two-blade wings are also featured on the side cowls. These wings feature winglets and further add to the downforce generated by the upper cowl’s chin spoiler and the upper wings. 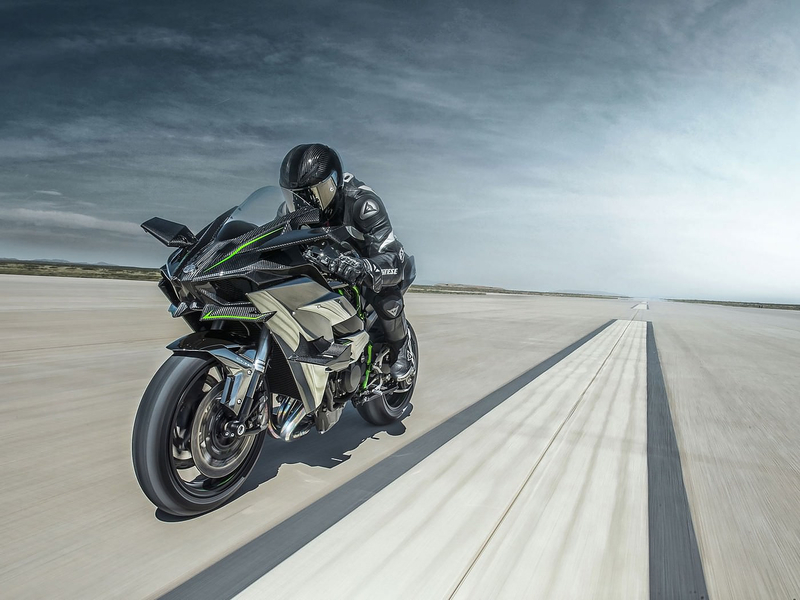 More than any motorcycle Kawasaki has built to date, the Ninja H2R is a showcase of craftsmanship, build quality and superb fit and finish. 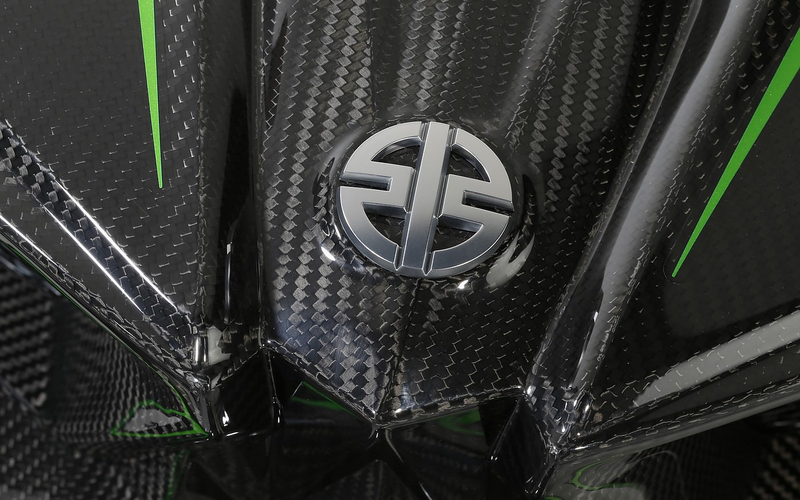 Even its brilliant silver-mirror paint was specially developed for the Ninja H2R. The welding on its new trellis frame is consistently elegant and hand assembly in an area dedicated exclusively to this model ensures an immaculate fit and finish. ​With these technical specs 200 mph speed isn’t just in the cards, it’s guaranteed, yet in order to experience that kind of adrenaline overdose you will need to dish out around $50.000 and be lucky enough to secure one of the very few limited edition examples that will be produced. 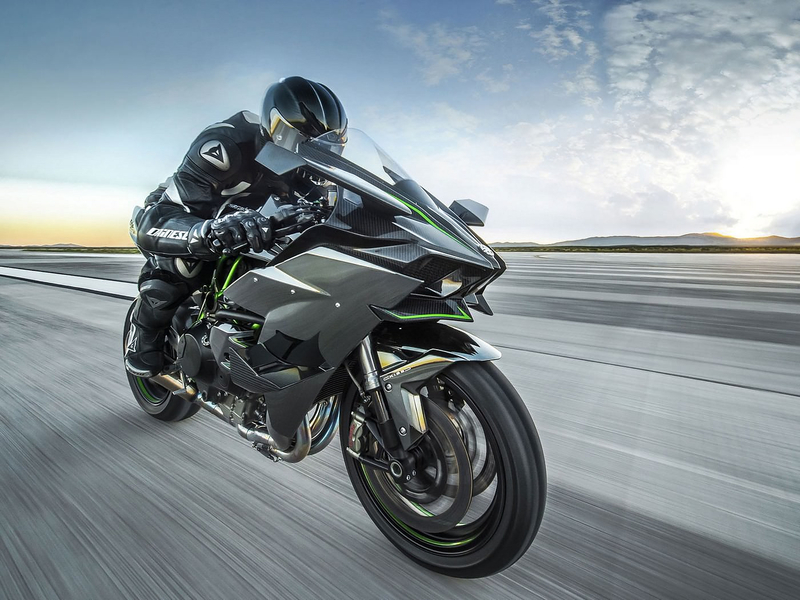 Right now, Kawasaki is not saying about the number of bikes it is going to built, yet we are 100% certain his will be a very limited collectors piece. However if you really need 300 HP on a motorcycle and feel excluded from the party, worry not. 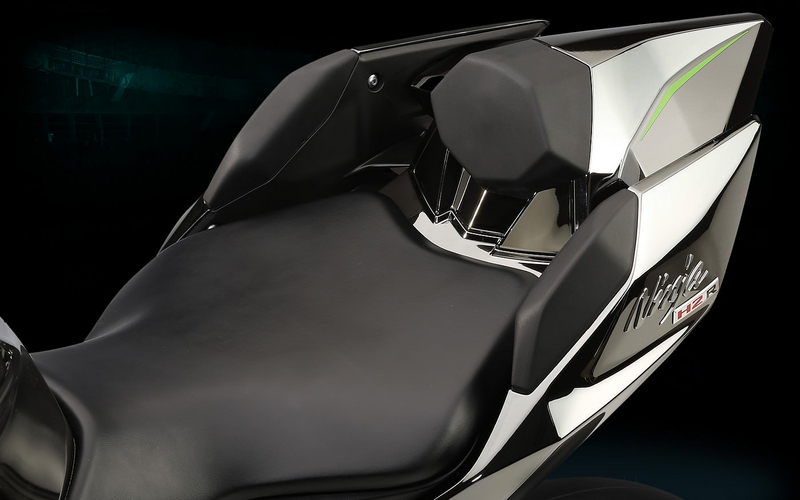 A street version is coming later this year, the H2. 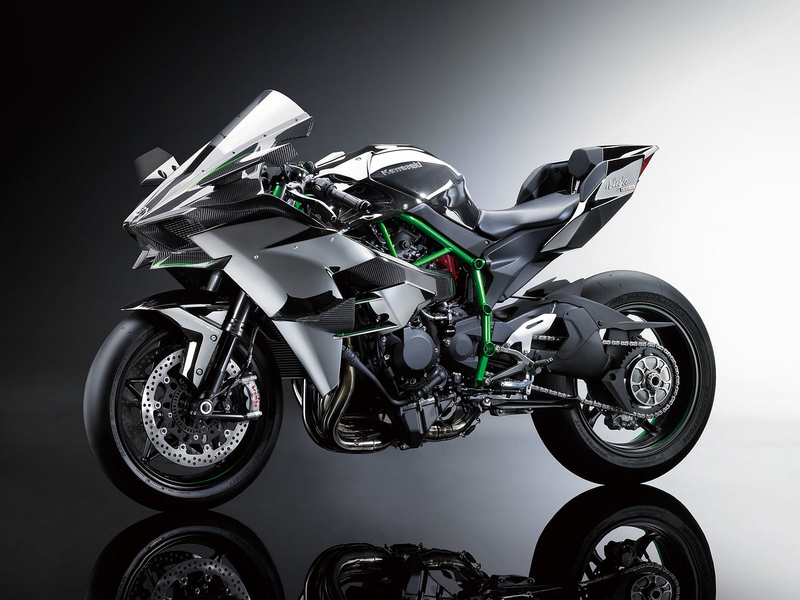 According to leaked specifications, the Kawasaki H2 will have equally brutal horsepower with a price tag rumored to be around $25.000.